Zone A is the safest. You can move in this zone as guided by your therapist and surgeon. Zone B is next safest. You should be careful moving in this zone without supervision and guidance. Zone C is the least safe and must be avoided. Your shoulder is most vulnerable to stressing a repair or an injury when your elbow is in this zone. In moving your shoulder up and down or back and forth , try to keep your elbow in the A zone. These positions place the least stress on your shoulder–and make your motions efficient–for activities, exercise, and rehabilitation. When your elbow is in the B zone, there is moderate stress on your shoulder. Having your elbow in the C zone places your shoulder under the most stress. 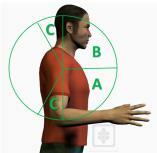 Avoid motions in the C zone, especially if you have an injured shoulder.